I was chuffed. A fellow Flickr person added my photo (you can see it on the left) to his "favorites"! His/her name is "Lagged2death". What's the world coming to? And what's more, what does this mean? And what does this say about me? I am starting to become, horror of horrors, a cyber social network person. I get my kicks from some person who I do not know (and who I will never know) in FaceBook jargon, "liking" one of my photos. Call it "adding it as a favorite", "liking it", "hearting it", "plus one-ing" or "one-plussing" it, it's all the same. Someone clicked something I'd posted, and I was pleased. Good god! I'm starting to have a cyber life. 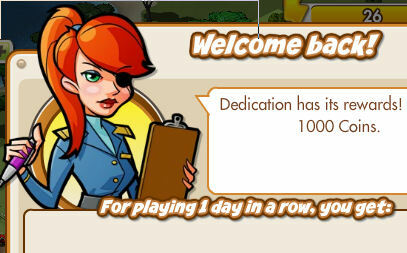 Well better than no life. Come to think of it, I wonder, does "Lagged2death" have a life? From Wiki entry on Dylan's Candy Bar: "Dylan's Candy Bar is a chain of boutique candy shops and candy supplier currently located in New York City, East Hampton, Roosevelt Field, Orlando and Houston, as well as in wholesale venues around the globe. It is owned by Dylan Lauren, daughter of Ralph Lauren." 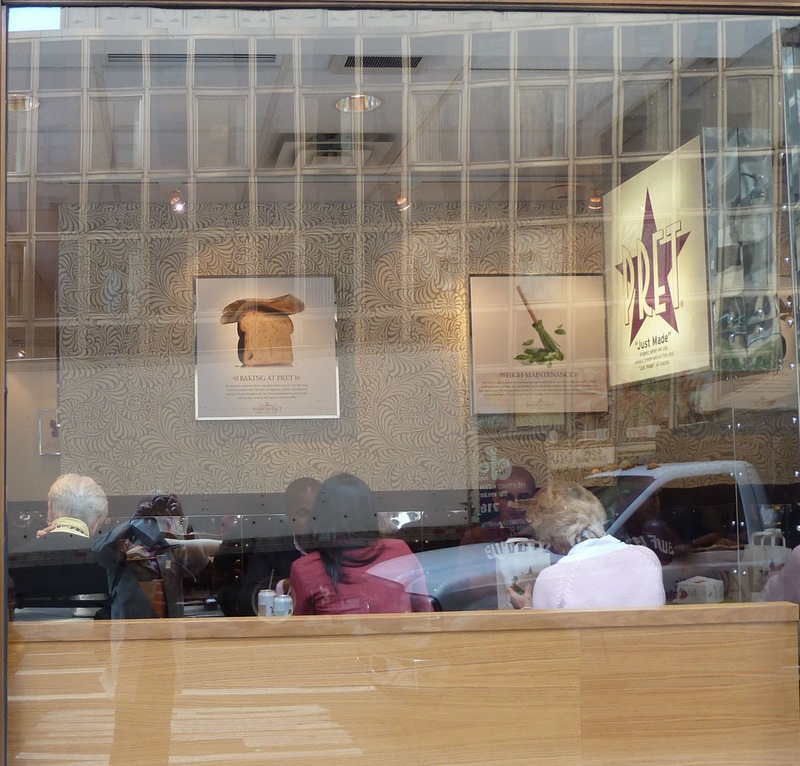 Readers of my blog with recognize this photo of Dylan's store-front from a few years back. Did "RIP" stand for something other than I'd understood it for the last 100 years? I stood there staring like someone from another century. Which of course I am! Hells bells! And then it dawned on me. Or should I say "dusked on me"? It was all about graves, cemeteries, skeletons, scary dead people, ghosts ... Halloween! I moved away from Dylan's window. My bus was coming. I got on and took my seat. And "tweeted". "I am so NOT a Halloween person!" b: I am a social networking person. A Tale of Two Centers, or Should that be Centres? Anything Goes. - from Cole Porter, "Anything Goes"
This past week started with a "Centre" and ended with a "Center", the latter being by far the more pleasurable. 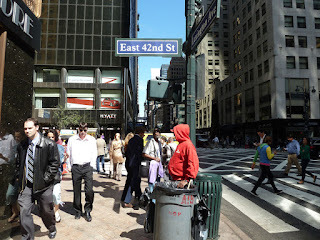 Pleasurable in the main because it was organized by my good friend Babs, an aficionado of all things New York. Whenever I go out with Barbara I let her organize everything. Which she does, choosing venues, restaurants, entertainments with impeccable taste. 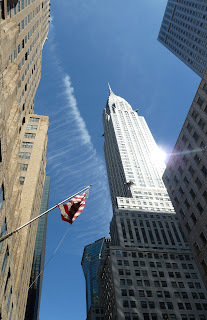 And this week was a treat for both of us - a day at the Lincoln Center, the central part of which was an afternoon at Paul McCartney's "Ocean's Kingdom". 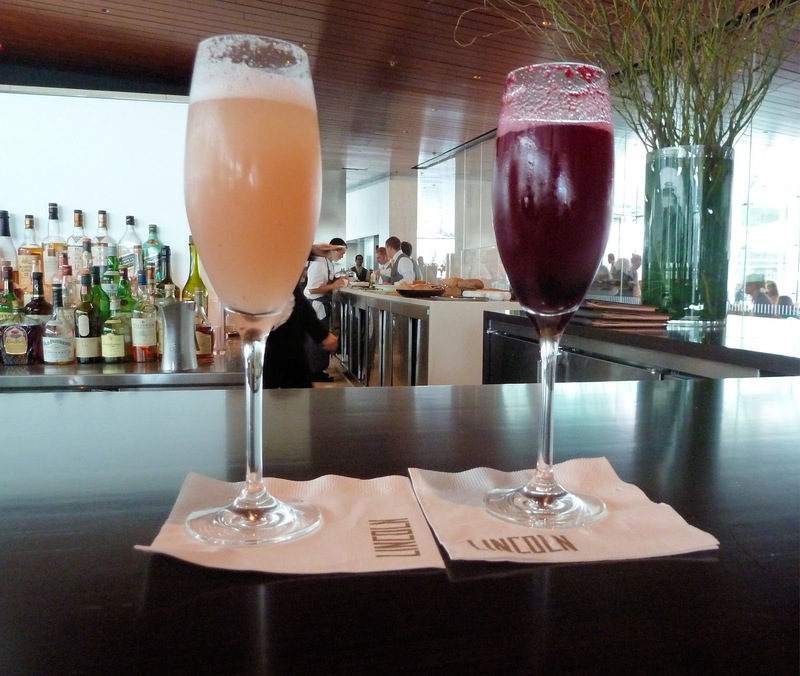 We started the day with pre-afternoon drinks at Jonathan Benno's "Lincoln", located in the grounds of the Lincoln Center. 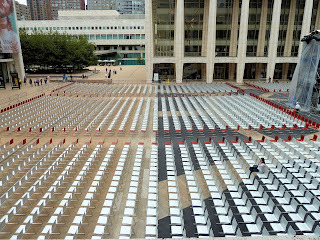 When I think of the Lincoln Center I always smile, remembering my early days in New York when a mutual Australian friend of myself and Babs, volunteered to show me around. He took me everywhere Manhattan, - or so I thought. 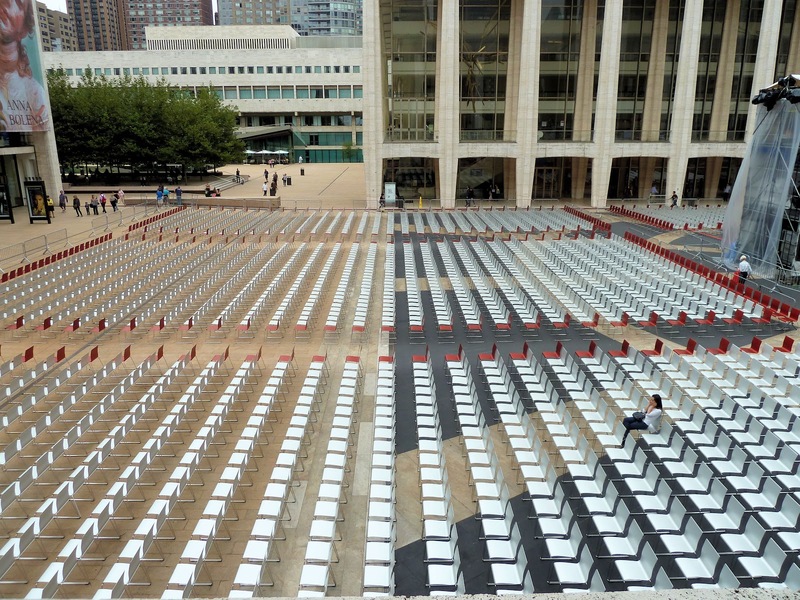 And then one day I realized that I'd never been taken to the Lincoln Center. "What's the Lincoln Center like, Robin," I asked innocently. "Like Chadstone, Daaahling" he disparaged, referring to a sixties white monstrosity of a shopping mall in suburban Melbourne, our home-town. Robin - who would buy linen napkins in colors to match his salads - last time I saw him was years ago at the Union Square Farmers' Market. He was buying aubergines, "But WHERE on earth I'll find purple napkins THIS shade, in THIS country, I DON'T know!" he drawled. Yes Robin had style, but a up-market, gay, Melbourne style. Babs, although she hails from Perth, is pure New York. When she called to invite me to a day at the Lincoln Center to see Paul McCartney's new ballet, "Ocean's Kingdom", to be followed by dinner at Daniel Boulud's newly opened "Boulud Sud", I was enthusiastic. I googled "Boulud Sud" and read that the dress code is "elegant casual". Typical Babs. But I was concerned. I can "do" casual, it was the elegant part that had me worried. But Babs assured me she'd just be "throwing anything on". After all, it was Manhattan, and a Saturday in the day time, where anything goes. Of course she turned up impeccably dressed in theme for the ballet. Slender, lithe Babs in figure-hugging black except for her shoes which were golden and square-toed, ballerina style. After our pre-event drinks at the Lincoln it was off to the David H. Koch Theater to see the only second performance of Paul McCartney's "Ocean's Kingdom". There are two types of humans in this world, "John Lennon" and "Paul McCartney" people. Naturally Babs and I are both John Lennon people. We wonder why, "Isn't everyone?" Still, Paul McCartey is Paul McCartney and we were also interested in his daughter's costume design for the Peter Martins' choreographed ballet. I've read the reviews today, O boy (pun intended) and they are universally uncompromisingly bad, especially I thought Alistair MacAuwlay's "Pop God Dives Into World of Ballet" in the New York Times. Mr. MacAuwlay seems to have it in for Mr Martins. Lucky for Melbourne, Mr Martins has never seen Chadstone! Then, no doubt he would really get the knives out! Then it was off to Boulud Sud where the food and wine were excellent. By 9:00 pm when we set off home we were both exhausted. Yes I ended my week at the Lincoln Center, but started it at Centre Street. 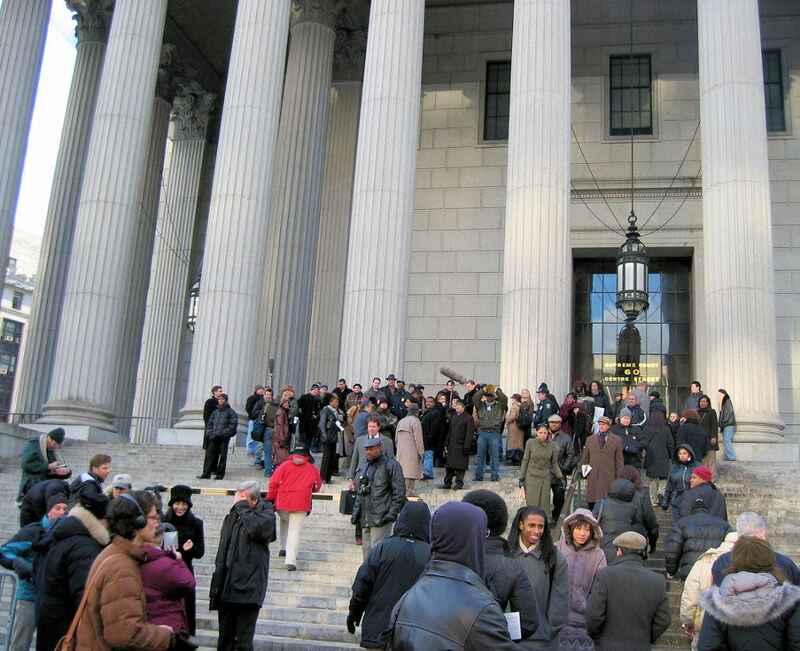 Centre Street in Lower Manhattan, where the courthouses are situated. I wonder why it has the English spelling? Perhaps because it originated during colonial times. Yes I was on jury duty. 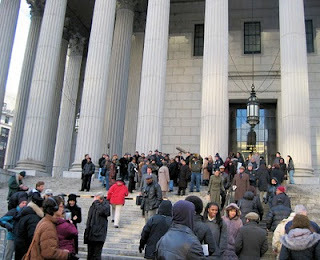 In fact I ended up actually serving on a jury. I was "Juror Number Two". And it was almost fun. I even got a laugh from the presiding judge. "Help your friends build their Empires. Send them a Mystery Gift" - Blurb from FaceBook's "Empires and Allies"
"Alert all commands. Calculate every possible destination along their last known trajectory." - Darth Vader, "The Empire Strikes Back"
I was sitting ... well reclining ... in the dentist's chair. Unable to speak. Don't get me wrong. I like my dentist. He's a Larry David sorta guy. A New Yorker. A talker. And I was, a captive audience. He was explaining how he'd become addicted to a FaceBook "game" - "Empires and Allies". "It's great," he said. "You get points and friends come in to help you - like a cooperative. It's kinda social. It isn't Farmville. That's not somewhere I'd go. This is interesting. What do YOU play?" I hesitated. Was it the nitrous oxide kicking in, or the fact that my mouth was full of dental paraphernalia? Whatever. After a hundred years I answered. "I like 'Angry Birds'. I am addicted to 'Angry Birds'." At least that's what I meant to say. What with the nitrous, the metal, the tubes etc, I was surprised that he understood. 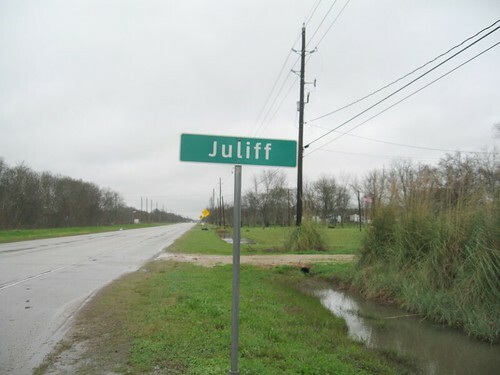 Juliff, Texas - a non-virtual empire? "Oh, Angry Birds, but that's played ALONE. 'Empire and Allies' is a GROUP effort." He went on to explain how people "related to each other" as they built or lost their empires. Oh yes, he liked another FaceBook game. Some poker thing where you all sat around a virtual cyber imaginary table and played poker. You could even buy a buddy a virtual beer. Back home I decided to take a look at "Empires and Allies". After all, I'd been disbelieving when a friend had told me about Angry Birds, and now I am an addict. Moreover, I liked the name "Empires and Allies" and imagined it'd be something like the old board-game "Diplomacy" where there was a battle of the wits, and duplicity reigned supreme. So I did a FaceBook search and found the thing. Yes, "thing". I joined. I even named my empire, after my brother - "Empire of the Aumbat." I was presented with a cartoon-like picture of a battlefield and intuitively clicked around and built a few things - schools, huts, artillery. So far, so good. I waited. Upon virtually surveying the virtual environment I realised I needed virtual allies. I brought up the "add allies" screen and proceeded to "invite" all of my friends who owed me a favor. I was starting to cringe, remembering all those Farmville requests I used to get annoyed by. "Annie needs a donkey to chew her grass. Can you help?" Eventually, I succeeded, as is my wont, in suppressing the whole negative empire thing, and shut down the computer. Still a bit of my "empire" lived on, and the next morning I checked it out. No one had replied. The Empire of the Aumbat still had a population of ONE. Days passed. My Empire was in stagnation mode. A few emails surfaced - encouraging emails like, "Congratulations you have earned 5 cents, buy yourself a centurion" kinda thing. I quaked in my stilettos. How was I to "buy" a centurion? Did the message mean "literally"? Would my credit card be charged? Gingerly I re-entered my Empire. It was still there. A sad little affair of one hut, a tank and a few yeomen. This social life was not for me! So much for enlisting one's friends. Where were my allies when I needed them? Farming their Farmville farms, no doubt. And then the light-globe came on. Some people are just not meant to be social! Well, I call it a voyage as it has a beginning, and an end. The beginning - I was remembering a long-ago meeting. A long-ago meeting with someone I'd known long-ago. Her name is Joy, and I'd known her as a child. Later, she had worked with my mother at a law firm in Melbourne. I hadn't seen her since I was twelve when some time in the late nineties, I bumped into her at a BBQ in Australia. I didn't recognize her, it being a hundred years since we'd last met. She was striding purposefully toward me. "You are Kate Juliff," she accused. "You and my cousin were mean to me when I was eleven and I've spent the last 30 years in therapy as a result." And then, without drawing breath (she is obviously not a smoker) she continued with, "I worked at the same place as your mother after I left school. Mrs Juliff was such a NICE lady!" Why did I remember this long-ago monologue of long ago last Wednesday morning in New York? I have no idea, but remember it I did, and I decided to become "a NICE person". I'm always in for a change, and instead of redecorating or buying new clothes or taking up a new interest, I decided to become a "nice person". And that was the beginning of the niceness journey. It all went well. To begin with. I was really nice to the bus driver saying "good morning" on alighting, and "thank you" on departing. I asked the doorman how was his young son and he beamed, surprised no doubt that I remembered that his wife had given birth just two years ago. Then today, I was nice to my dentist and his assistant, asking how they were and smiling throughout the agony. On my way home I spotted a new store, "Kidding Around" in Grand Central. I went in and browsed and found some New York toys and books. The nice person thought, these would be good for my grandchild, aged five months. When I was at the counter getting ready to pay for my New York kid things, the clerk asked me if I'd like to join their mailing list. Ordinarily I'd have just snarled and said no thank you, but today I was being nice. "Certainly," I replied with a smile. "What do you think of my new store?" she asked. "It's delightful!" I answered. Nicely. "Great, please accept this gift in appreciation," she said, handing me a mermaid doll replete with silvery tail. I was all niceness. The sun was shining. New York, New York. What had I been missing in my prior non-nice life? I stopped at Pret a Manger, the English fast-but-healthy food place, for an egg sandwich and a cappuccino. I smiled as I ordered. The barista smiled back. And then I decided to stop at the post office to mail my "Kidding Around" purchases back to Australia. 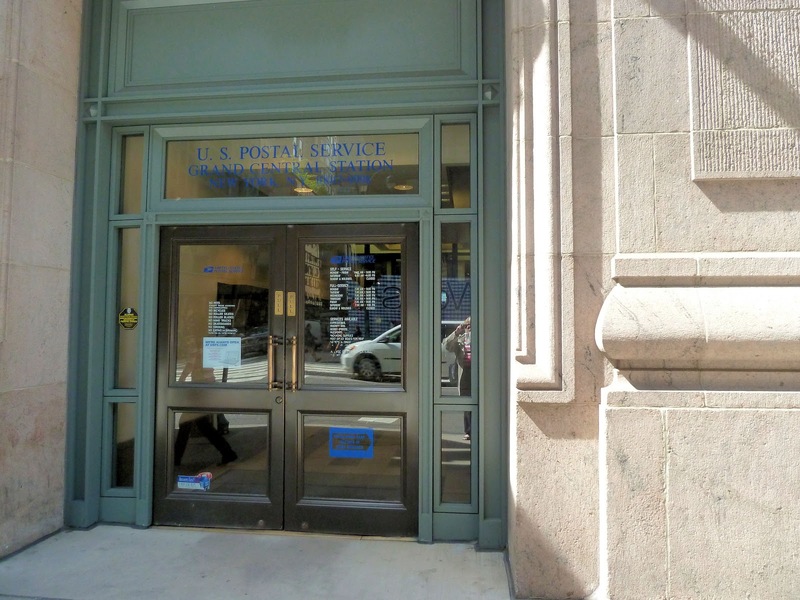 There's a post office in Grand Central so it was convenient. Usually I buy my postage online. But the new "nice" me decided to interact with humans. 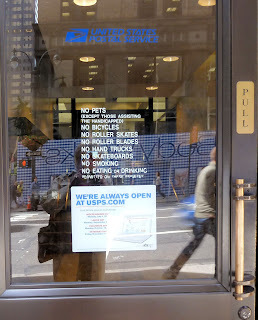 Besides, I'd read that the US Postal Service was about to go under. Best to support the human postal workers, thought the new "nice" me. On entering the hall-like interior of the Grand Central Post Office, I saw that human contact was being discouraged. Signs everywhere advised consumers to use "DYI" parcels. I looked for an international DYI section, and finding none, pushed the books, the toy New York taxi and mermaid from "Kidding Around" into a standard US Post box, I found a customs form, filled it in, and joined a line (queue). There were only about six people ahead of me and a greeter-sort-of-US-Post-employee was wandering around looking as if she was there to help us. As one of the customers finished her transactions at the counter and headed off toward the exit, Ms Greeter-Person confronted her. "People are complaining you took a long time!" she accused. The customer looked taken-aback. "But all I did was buy stamps," she explained, almost apologizing. "Don't blame me!" came the reply. "I am not allowed to hurry you up, I am just reporting the general consensus of your fellow customers." Bloody hell! I decided to keep a low profile and stood dutifully for around ten minutes, when Ms Greeter-Person approached me and told me I was in the wrong line. "How could I know?" I asked, and then from the look on her face thought better of it, and joined the only other line in the place. There were around twelve people ahead of me. "You need to tape that box up," she complained. I explained that I'd taken the box from a pile under a sign encouraging us to use them, and how could I tape it up myself? Upon which she thrust a roll of USPS tape into my hand and told me to go to the packing area and to tape it, and to then come back to see her before re-joining the line. Well I tried. The roll was about 10" in diameter. I was trying to push the box flaps together while at the same time holding my handbag, my lettuce sandwich from Pret A Manger, the USPS tape roll, and the custom form. It was all too much. I asked another customer if she could help me. Recognizing me as a "nice person", she readily complied. We got part of the tape stuck to the box but how to cut it? The helpful other-customer tried with her nails. Then with her teeth. There was no way! I thanked her nicely and approached Ms Greeter-Person. "I'm sorry but I can't do this," I said. "I'd need scissors!" "Well the PUBLIC (shudder shudder) STEAL the dispensers so what can we do," she replied. And then my journey ended. 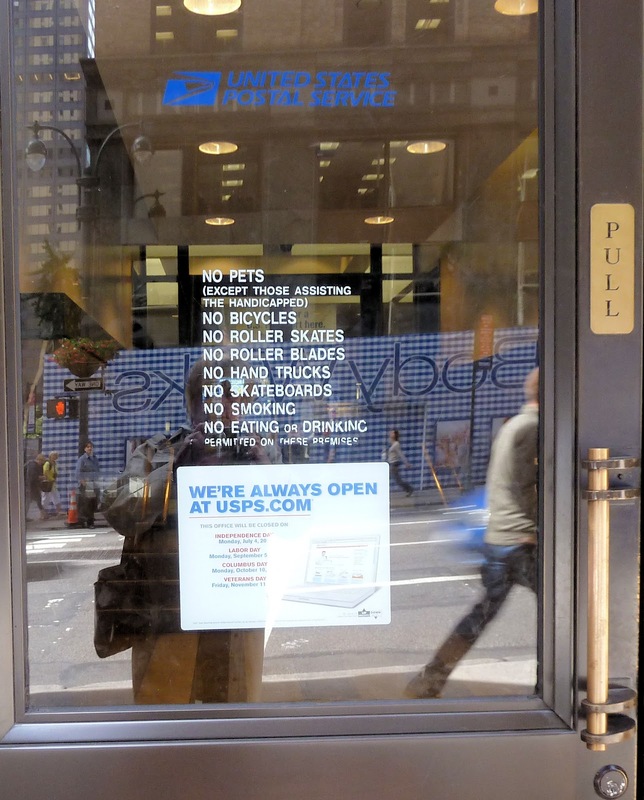 "No wonder the Postal Service is going broke!" I snarled. Quick as a flash she New-York-answered, "EXCUSE me! But I wouldn't march into YOUR work and insult YOU!" "Oh," I came back, giving as good as I got. "I bet you would!" "And it isn't why we are going broke," she added. Decades passed and then it was my turn. A clerk with a head like a pencil snarled at me and made me wait while he translated my hand-written custom form into ASCII on his keyboard. After an eternity I saw the charge, $45, come up on the customer display pad. I went to swipe my credit card. "Not now!" he screamed. I shrank back. A few years later he commanded "Now!" I swiped my card. A dotted line appeared on the pad, so I picked up the stylus that was anchored to the pad, to sign my name. "NO NO NO!" he said. "On PAPER. With a PEN! THAT is not a pen!!!" I complied. I just wanted out of there. I remembered the American saying about "getting the hell out of Dodge" and suddenly understood it. I walked slowly to the exit, trying to get the niceness feeling back. But it was shivering, recoiled, hiding somewhere, shrivelled deep inside some safe part of my mind. They were all of 95. 95 years old, that is. - A husband and wife. On the M102, the MTA bus that runs north along Third. I was sitting opposite them. Unfortunately, you can only see their legs. I tried to snap a candid pic surrepticiously with my cell phone, but the woman - the one with the knee-length socks - was too quick for me. "Excuse me lady," she yelled for all the bus to hear. "You ain't takin' no pictures!" I avoided eye contact and pretended to be texting. Hence the photo of the legs. That's her husband. On her right. They'd got onto the bus at 68th Street. She couldn't find her ticket, and stood halfway between the driver and the step to the door, searching in her handbag. "Lost it again," her husband smirked - a braver man than I. She let loose as he scuttled toward the middle of the bus to take shelter. In vain. "I am not the one who loses things," she tiraded. "Why am I the one who has to do everything for you and your pathetic family?" All this being said from her place at the front of the bus for the whole bus to hear. She sat down opposite me, and when the woman to her right got up to leave she shrieked at her husband to join her. 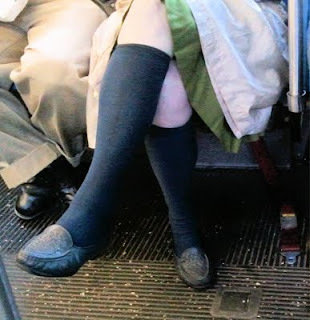 There were at least ten sets of seats between her and him, but the bus was her private space. "Move HERE!" she commanded. Which he did. He dare not do otherwise. There ensued a monologue about how she'd cleaned the kitchen cupboards because some relative of HIS was coming to stay. Even the people jabbering on their cell phones were drowned out. The husband just sat there. Then, just when it seemed that she was winding down, for some reason she realized it was nearly 9/11. "Do you know how many firemen died because of 9/11?" she snapped at her spouse. "I do actually," he beamed triumphantly. "343! ﻿"WRONG!" she cackled. "343 at Ground Zero but hundreds more after that because of the dust and stuff! Ha!" To give the guy credit, he tried to wheedle out of it, explaining that he thought she meant ON 9/11. To no avail. "Did I say that?" she snapped, "WHEN did I say that? When did I say, 'ON 9/11?'" It was around then that I decided to snap her picture. I should have realized this was one sharp lady. She knew instantly what I was doing, and then made sure that the whole bus knew. I lowered the cell phone, tilting it down. I had no desire to be the object of her wrath. And so there you have it. Legs. Is there an upper age limit on eligibility for running for president of the United States? I think not. I'll check it out and if there isn't, and IF I can find her, I will suggest she run. At least she'd be interesting. After the old woman and her husband let the bus, it seemed strangely, eerily, quiet. All we could hear were the sounds of the under-thirties talking loudly on their cell phones, back-grounded with muffled sounds of rap music emanating from iPods. Oh, and the honking of horns. And the screeching sirens. And the clunking sound of the bus's shock absorbers bumping into the bus's under-carriage as it hopped its way from pot-hole to pot-hole, heading north up Third. My brother still has his FaceBook page. He died last January. He was 61. It somehow comforts me that his FaceBook page exists. A legacy. I've long pondered the effect of modern technology on our access to the memories of things past. Take my kids for example. They were born in the early to mid-seventies. 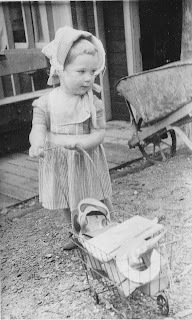 I have photos of them, but no videos, no webpages, no digital footprints of their early lives. I don't even have the sound of their voices on tape, let alone on video or CD. Just a few photos, developed from film. And yes I've scanned them in, but as they were not digitally recorded at the time, the number of them in no way compares to the hundreds of photos digitized by the modern day cameras, of babies today. And my own childhood. Was there even color? I have to smile, remembering my daughter when she was about eight. She'd been watching some old movies on the TV. In black and white. A few days later she asked me, "What was it like, Mum, living in the world when everything was black and white?" ﻿ Yeah, what was it like? I actually remember my childhood as being in black and white. I wonder. Is that because the photos of me as a child were all in black and white. Are my early childhood memories only memories of memories of photos. Or was it that the fifties and early sixties of last century were in fact, monochromatic? Before me. Before my mother. Before my grandmother. There were not even photos. Those ancestors could leave us very little. 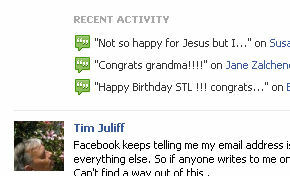 All I have of "Juliffs" going back 10 generations, are transcribed passages from Last Will and Testaments. Signed with thumbprints apparently! But that being so - all that is left of my ancestor Will, apart from a gravestone somewhere in Cornwell, is his last Will and Testament. We don't know what he looked like, we don't know his likes, his dislikes. We certainly don't know what filmstar he would have been had he been a filmstar. Nope, old Will wasn't on FaceBook and there was no 19th century equivalent. And so, when I think, which I do every day, of my brother Tim, I say a secret unconscious, unacknowledged, unspoken thank you, to Mr Mark Zuckerberg and his ilk. "What happens after your final status update? ", asks CNN's Adam Ostrow. What was my brother's last, his final update? I logged on to Tim's FaceBook. There was something there about a street in Melbourne being flooded. Not an update really. More a Wall posting of a news item from the Melbourne Age. So I scrolled back. And back. And then I came to it. Someone had wished all her FaceBook friends, "Happy Easter!" "Not so happy for Jesus," he'd "statused". Ever since there was such a thing as apps, I've been trying to dream up one to make my fortune. And every idea I've had, has proven to have already been taken. Eventually I decided that I was a bit too slow on the uptake. Age had gotten the better of me; a new generation of people brought up on iPods, iMacs and eco-burgers was taking over. But then ... I saw the light. It happened when I was checking my Twitter account. Jedro74 had posted the following, "I CANNOT believe the Australian media is ignoring this story! http://twitpic.com/6e1mui". It was nothing to do with Assange. It was just that old Australian simplicity, that je ne sais quoi of the unworldly, the unsophisticated, that other worldliness that MAY exist in America, but which I have yet to come across, was alive and well. Naive Americans like Christine O'Donnell tend to believe in the devil and witches. Naive Australians are not held back by primitive beliefs in Christianity circa AD500. Naive Australians are more focused on the mundane. "Out-of-date pasty is sold to young mum", screamed Australia's Folkestone Herald on August 25th. "Toddler took bite of food three days past its sell-by date", it groaned. Page one news! One can only guess the readership of the Folkestone Herald . My mind drifted back to a hundred years ago when I myself was a "young mum". I wasn't in paid employment - I'd decided to stay at home to raise the children. But I'd always wanted my own income. What work can one do at home? I discovered an income source. An Australian women's magazine, "The New Idea" had a column, called "The Mere Male". All it was, was a collection of letters from readers about some weird thing their "hubbies" had done. You wrote in with your "Mere Male" tale and if it was published you were sent a check for $5. If it made "Letter of the Week", you got more. And so I set to work. I can't remember all my letters but I do remember the first one. "I asked MM (New Idea for "Mere Male") to wash the lettuce while I was going out to shop. When I came back I saw him hosing the lettuce on the lawn in the front yard". Jedro74 was about 18 months old at the time. And I earned $10 for my contribution. Now, my reasoning is this - if the "New Idea", which was in all probability, and probably still is, owned by the Murdoch Press, could pay me tens of dollars way back in the Dark Ages, they must have had a reason. And the reason MUST have been that there was a market made up of people who actually wanted to read such idiocy. A market that has been forgotten - forgotten by virtue of the focus on the educated, the sophisticated, the high tech, the Generation teXters. I'm pretty sure I can tap into that market. The "Mere Male" readers of OZ - those people don't want an app that will monitor their gym activity, apps that will check their heart rate and how many miles they jogged to Starbucks, apps that know when ARRS falls below $11. Such people don't want Kindle or Nook Apps. They certainly don't want to read the Times Literary Supplement on iPads. They want stuff like "Mere Male" or information about two year olds who might have eaten stale bread. Yes-siree-Bob, I have found an untapped source. And THAT, dear reader, is my market. But before anyone accuses me of being condescending, elitist, ex-MacRob girl or Ms Smarty Pants - remember - I pride myself on being just that.